The Law School has up to four DfE studentships and one VCRS studentship this year. Applications will open on Tuesday, 18 December 2018 and close on Monday, 8 February 2019, to start PhD studies in September 2019. Applications are welcome in any area, but are particularly encouraged in areas of specialisation for the School and its associated units: the Transitional Justice Institute, the Ulster University Law Clinic, and the Legal Innovation Centre. We welcome applications in specified thematic areas: human rights, international law, law and innovation, law and social justice, transitional justice, public law and legal theory. Applicants are encouraged to contact potential supervisors in good time to discuss draft research proposals. For general enquiries please contact the Research Director for Law, Prof Siobhan Wills or one of our PhD coordinators: Prof Cath Collins or Dr Thomas Hansen. Allocation of supervisors will be made during the selection process. The supervisory team will depend on the proposal. We list a number of named supervisors on these pages for contact purposes, but please note they may or may not be included on any supervision team. We welcome interdisciplinary research proposals, and may appoint supervisors from outside the law school. Show that you have thought about how you will fit the plan into a three year programme. 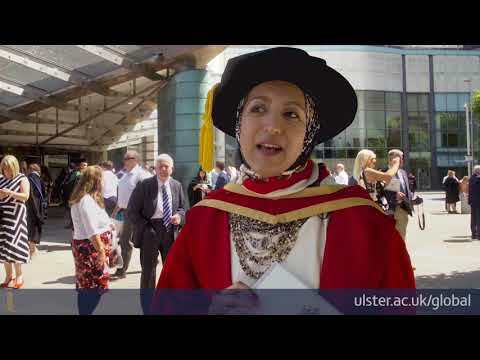 The lecturers at Ulster University are among the best in the world. Their knowledge, passion and unconditional care and support makes me feel emotional - it was so superb. The whole experience of Ulster and the warmth, generosity and hospitality of the Northern Irish people has made a lasting impression on my life.